I usually don't put my neck out there and say "favourite" when it comes to cover shoots or Vogue, but this is an exception. Blake Lively's August Vogue cover is my dream shoot. I'm not talking about fashion in general, I'm talking about the shoot I'd like to star in myself. Oh yeah, I just went totally narcissistic on you here. First of all, Blake Lively is shot in Ralph Lauren for the cover. Check mark on that one, big check mark. Then we move onto the other pictures, all shot by Mario Testino, by the way. 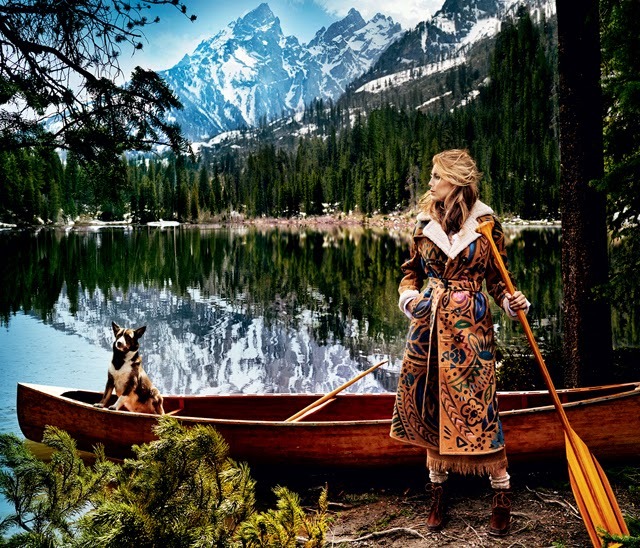 Lively is working the hottest trend this season - country western - and is shot in Jackson Hole, Wyoming. Although, in my head, I'm picturing it all being shot on the RRL ranch. It could easier double for such a heavenly place. In short, I don't see how this can be topped, like ever! Enjoy the pictures below and check out more, along with the article on Vogue now. All pictures courtesy of Vogue Magazine.